This is a later picture of James Fraser and his wife Janet Pringle Fraser. James Fraser was born 24 Aug 1822 in Biggar, Lanarkshire, Scotland, and died 19 Sep 1903 in Elizabeth, Jo Daviess County, Illinois. 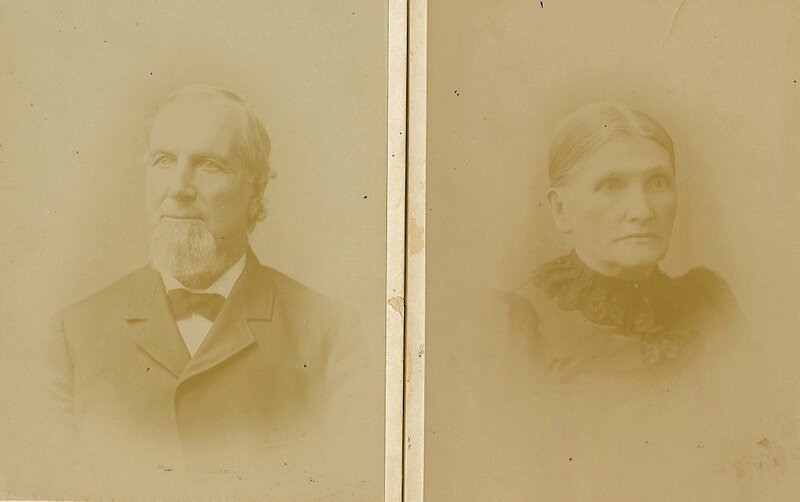 He married Janet Pringle June 4, 1845 in Elizabeth Township, Illinois, daughter of John Pringle and Sidney Patterson. She was born 10 Jan 1826 in Pinkey, Berwickshire, Scotland, and died 11 Apr 1908 in Elizabeth, Jo Daviess County, Illinois. James emigrated to America 1842 settled in Niagara, NY. In 1844 he set out for northern Illinois, setteling in Jo Daviess County, Illinois. gold mines in California, returning in 1852. In his native Scotland, James was employed in a woolen factory. About 1862, he started a mercantile business in Elizabeth. and being lived in today.